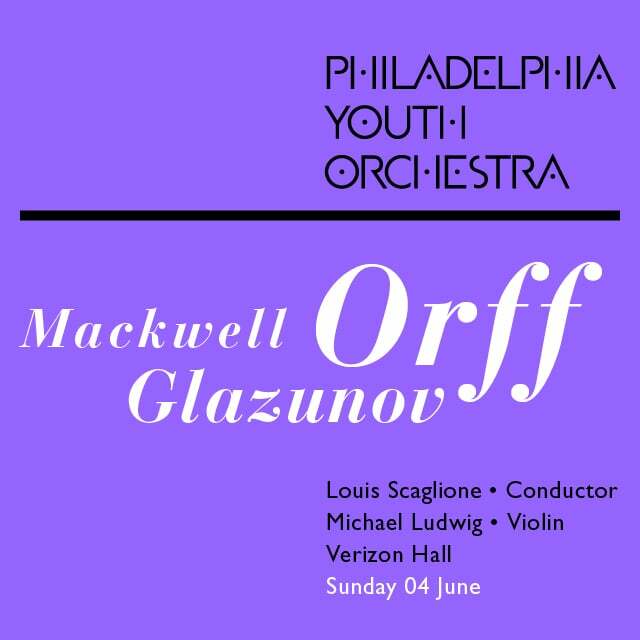 Over 100 PYO students, ages 14-21, will be joined by many guests including Violinist Michael Ludwig, The Mendelssohn Club of Philadelphia, The Philadelphia Boys Choir & Chorale and soloists Alexandra Nowakowski, Soprano, Eric Rieger, Tenor, and John Viscardi, Baritone. In addition, the PYO will perform the winning composition “III. Secretly Ramses the Second” by Alan Mackwell, the winner of the Inaugural Young Composers Competition. Prior to the concert, there will be a presentation of the Philadelphia Youth Orchestra’s 4th Annual Ovation Award for Inspiration and Outstanding Leadership in Music Education. The award was created to honor outstanding music teachers in the Delaware Valley who not only impart musical knowledge but help shape the lives of their students beyond the studio and stage. Ten finalists chosen by a blue-ribbon panel will be announced and presented with an award tribute, cash prize, and other recognition from the sponsors and one of them will be named the 2017 Ovation Award Grand Prize Winner. The Ovation Award is presented and endowed by H.E.L.P.® Foundation and sponsored by Jacobs Music Company and J.W. Pepper with WRTI-90.1 as partner. Included in the musical selections for the concert will be Mackwell’s winning composition “III. Secretly Ramses the Second”, Glazunov’s “Violin Concerto in A minor” and Orff’s “Carmina Burana”. Tickets for this event, priced at $15-$25, may be purchased online at www.pyos.org . For more information, call 215.893.1999. Alan Mackwell, a New Zealander-American, began studying piano in the third grade. When he was only an eighth-grade student, he began writing orchestral music. At that time, he was accepted to the American Festival of the Arts’ Composer’s Institute, where two of his pieces were performed. In 2014, he was one of 15 composers world-wide to attend the Interlochen Summer Arts Program for music composition, and he wrote for the World Youth Symphony Orchestra conducted by Jung-Ho Pak. Mackwell was selected in 2015 to attend the prestigious Boston Conservatory High School Composition Intensive. He is a three-time winner of the Texas Young Composer's Competition, placing 2nd in 2015 and 2016. He is currently pursuing a Bachelors of Music degree in Music Composition at the Boston Conservatory of Music. Hailed by Strad Magazine for his “effortless, envy-provoking technique… sweet tone, brilliant expression, and grand style”, Michael Ludwig enjoys a multi-faceted career as a soloist, recording artist, teacher and chamber musician. A former assistant concertmaster of the Philadelphia Orchestra who later became concertmaster of the Buffalo Philharmonic, he is currently the concertmaster of The Philly POPS orchestra. He has joined the faculty of Montclair State University’s John J. Cali School of Music as an adjunct professor of Violin. Under the direction of Paul Rardin, and one of this country’s oldest choruses, Mendelssohn Club of Philadelphia performs choral music to create a shared transcendent experience among its singers and audiences. Through its adventurous performances, Mendelssohn Club advances the development of choral music as an art form. Philadelphia Boys Choir & Chorale (PBCC), conducted by Jeff Smith, provides musical education for young men in the Philadelphia area. PBCC's 200 participants come from Pennsylvania, New Jersey, and Delaware and some commute from Virginia, Maryland, and the Appalachian Mountains. Polish-American soprano Alexandra Nowakowski the recipient of an Encouragement Award from the Giulio Gari Foundation in New York, is a District Winner of the Philadelphia Metropolitan Opera National Council Auditions, 2nd place winner in FAVA’s Grand Concours de Chant, and 1st place winner in the ACPC Marcella Kochanska Sembrich Vocal Competition. She is currently a third-year resident artist at the Academy of Vocal Arts in Philadelphia where she studies with Bill Schuman. She holds a bachelor’s degree from the University of Illinois at Urbana-Champaign where she studied with Cynthia Haymon. ​Eric Rieger has enjoyed success performing opera throughout Europe with such opera companies of Zürich, Luzern, Basel (Switzerland) and Novara (Italy) as well as Edinburgh Festival Theatre, Citizens Theatre (Scotland) and Everyman Palace Theatre (Ireland). Equally at home on the concert platform, Dr. Rieger has been featured at the Claudio Monteverdi Festival (Italy), the Royal Opera House at Covent Garden, the Concertgebouw (Amsterdam), and Carnegie Hall. A passionate recitalist, Dr. Rieger has performed with Lyric Fest (Philadelphia), Market Square Concerts (Harrisburg), St. John’s Smith Square (London), and many other venues across the U.S. and Europe. In addition to his performance career, Dr. Rieger is in demand as a voice teacher and lyric diction specialist. He is Assistant Professor of Voice at Westminster Choir College and on faculty of the CoOPERAtive Program. Baritone John Viscardi, New York native and graduate of the Academy of Vocal Arts (AVA), is a rising talent notably acknowledged for his diversity of vocal repertoire. He has seen great success in the American Competition circuit. He has received many awards including: 1st Place in the Gerda Lissner International Vocal Competition; 1st Place in the Concorso Internazionale F.P. Tosti and 1st Place in the Mario Lanza Scholarship Competition. This season he has performed the title role in Cyrano with Opera Carolina, Athos in The Three Musketeers with The Phoenicia International Festival of the Voice with recitals in Trevi and Ortona, Italy. With a distinguished career, highlights of the past few years include performing the title role in Cyrano with Michigan Opera Theatre, a return to San Louis Obispo as Marcello in La Boheme, Soloist in the Juliet Letters and the Motorcycle Cop in Dead Man Walking both with Lyric Opera of Kansas City, Bill Calhoun in Kiss Me Kate with the Phoenicia International Festival of the Voice, a concert in Tokyo, Japan, and much more.